The winner? The carriage horse, of course! As any city carriage driver could have told him, the buggies are surprisingly compact, light and make tight turns. When they’re pulled by one of the placid, experienced horses the drivers barely have to lift a finger to direct them. The hefty horses are adept at speeding up and slowing down their buggies, while the cumbersome electronic car couldn’t quite cut it in the city’s fast-moving traffic. 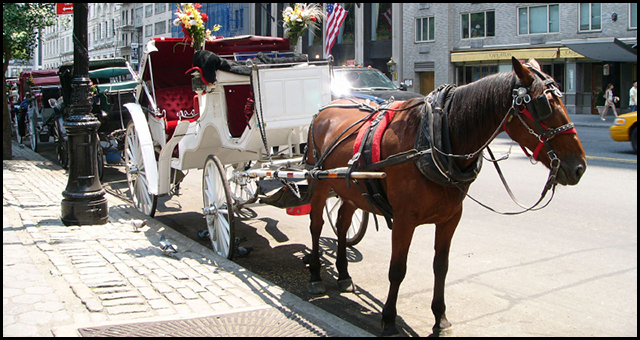 The aura of faded gentility, however, is part of what gave the horse carriage experience the most points: authenticity. The e-vehicles lacked soul and history, Huffman said, and there’s no replacing that no matter how many bells and whistles a vehicle designer adds on. Aside from the impressive tight turns, the environmental angle, the sense of authenticity and history, there’s something deeper to consider: the connection between horse and driver, the wonder of these incredibly strong and healthy animals doing what they love to do, and of course — the fun (which was ultimately the main reason the Car and Driver reviewer preferred carriage ride). You just can’t replace a good horse. Definitely a fun little read — our only quibble is that it would have been nice for the review to cover the welfare of the carriage horses as well; the drivers are people who clearly adore their horses and treat them very well, and no matter how many experts speak to the excellent care and treatment these majestic animals receive, it always helps to have another voice countering the anti-horse carriage propaganda machine!